I’ll be the first to admit that my time on the water in 2014 has been lacking. Yes, I understand that it’s only February, but I’ve only been on the water about 6 times this year. While to most, that may seem like a decent number, to us at Yak Outlaws, it is sorely lacking. I finally got my kayak on the water for the first time a couple of weeks ago, and was rewarded with a great day of fishing. Earlier this week, I’d picked up a new kayak, the Old Town Predator MX. 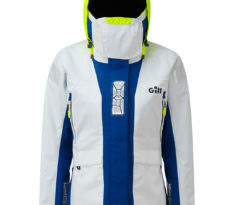 Suffice it to say that I was in dire need of getting her out on a maiden voyage! This past weekend provided the perfect opportunity. The weather was perfect, the winds calm and low, and the tides were going to be spot on. I must have done something to please the Fish Gods, as the weekend provided some epic fishing trips. I fished both Saturday and Sunday, and although Sunday’s trip was cut short, we still managed some decent numbers of redfish caught. On Saturday, fellow Outlaw Buddy was to meet me to get some time on the water, but had to back out due to illness An old friend (Richard) was also joining us on the trip, and late Friday evening, a new friend (and newly acquired kayak owner) Harriet asked to join with a friend (Cader). The four of us met at our local bait and tackle store, Browns Creek Fish Camp, to load up with bait and headed to the launch. The tide was lower than expected and it took a little while for us to get on a bite. 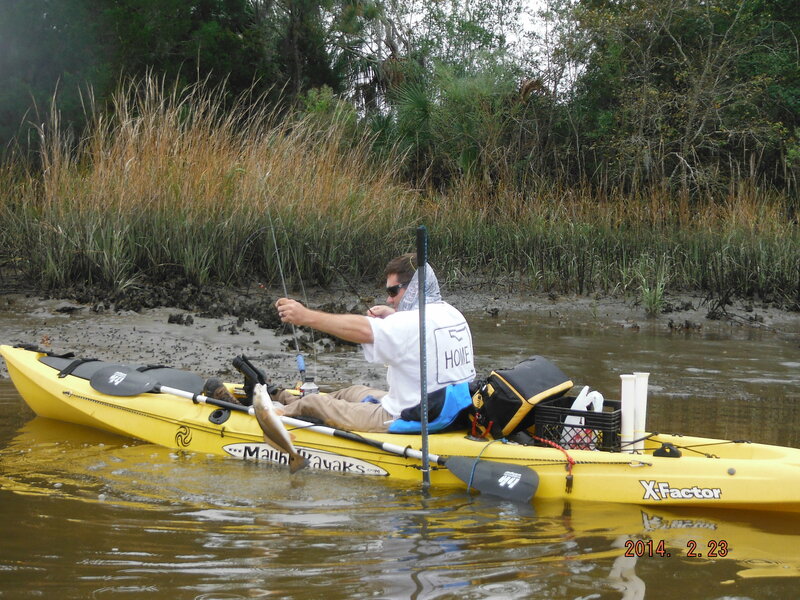 Out first couple of stops proved fruitless as the water was too low and the redfish weren’t around. We moved around a little bit looking for the bite, but no luck. Once the tide started to turn around and water started moving in, I decided to take everyone back to one of my honey-holes. We weren’t there long, when my Okuma Helios rod bends over and I reeled in a nice little redfish. 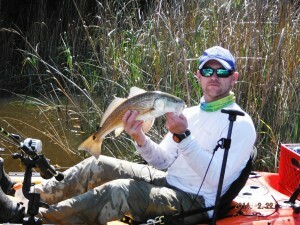 Another redfish came a little while longer, and Cader had to call it a day. I got Harriet repositioned to allow for a better cast into the honey hole, and before long an epic bite ensued. On several occasions Harriet, Richard, and myself were all hooked up simultaneously. There’s nothing like sitting in tight quarters with the three of us hooked up to redfish all at the same time. I actually lost count of all the redfish that were landed for those epic couple of hours. There was a mixture of undersized redfish, slot redfish, and Harriet showed us boys up with a beautiful just over the slot hawg of a redfish. I was able to get some great video on my GoPro Hero 3+ Black. While the bite was amazing, the company was what really made the day. Some great laughs and memories were made during those few hours, along with some interesting words being shared. I was honored to share the bite with everyone, and especially enjoyed watching Harriet slime up her newly purchased Jackson Kayaks Cuda 14 the proper way. The next day, I met up with an old college friend (Anthony), and we set up to grab some bait and head out to the water. The winds were non-existent, and the waters calm and smooth. 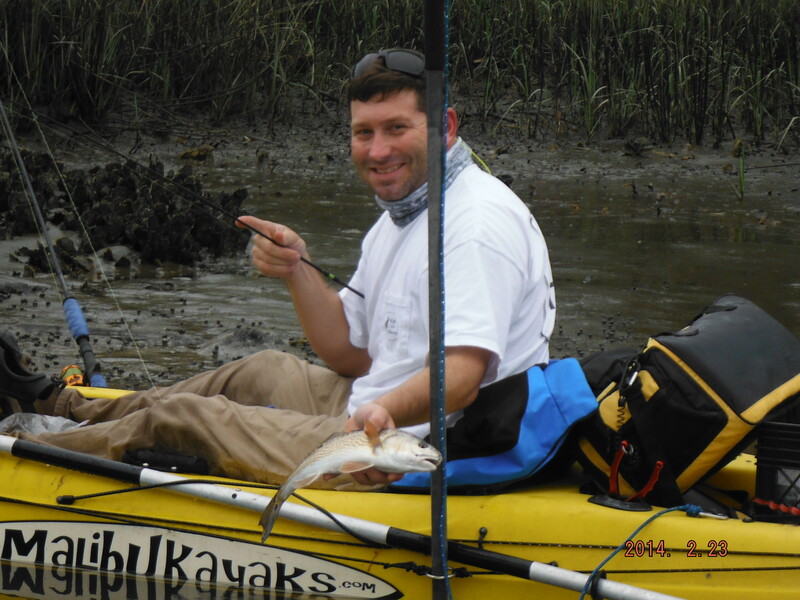 We took a leisurely pace heading back to my redfish hole, and upon entering the creek we decided to take a few casts at some oyster mounds along the way. 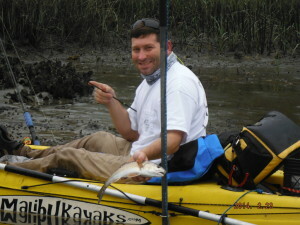 With the water sitting at low tide and calm, we could see just about every movement that the redfish made. As we entered the creek mouth, I noticed some nice swirls and wakes being made, and we slowly made our way to set up for some casts. As we came up on a row of oyster mounds, we noticed there was a school of redfish about 20 deep. We started casting, but they’d been spooked. 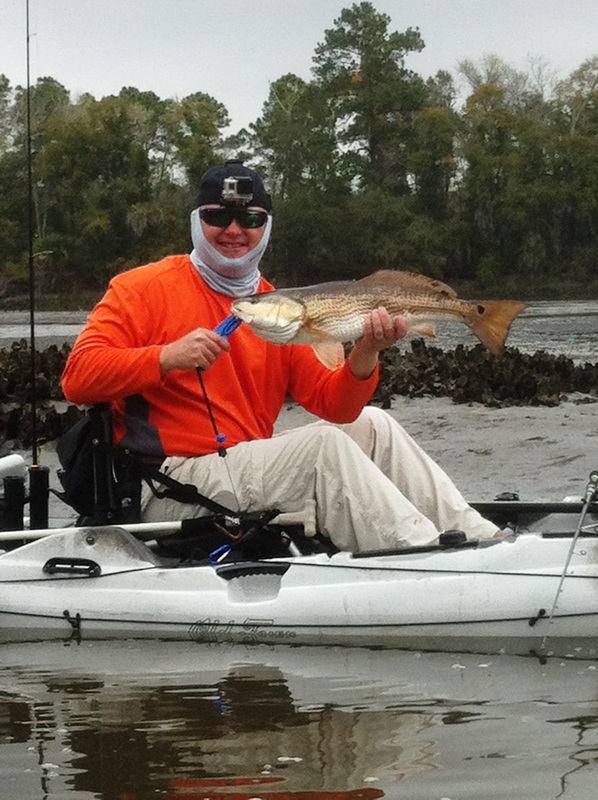 Nothing can be more frustrating that seeing redfish push wake all around you and there not be one taker amongst them. The frustration can tend to reach an elevated level quickly. 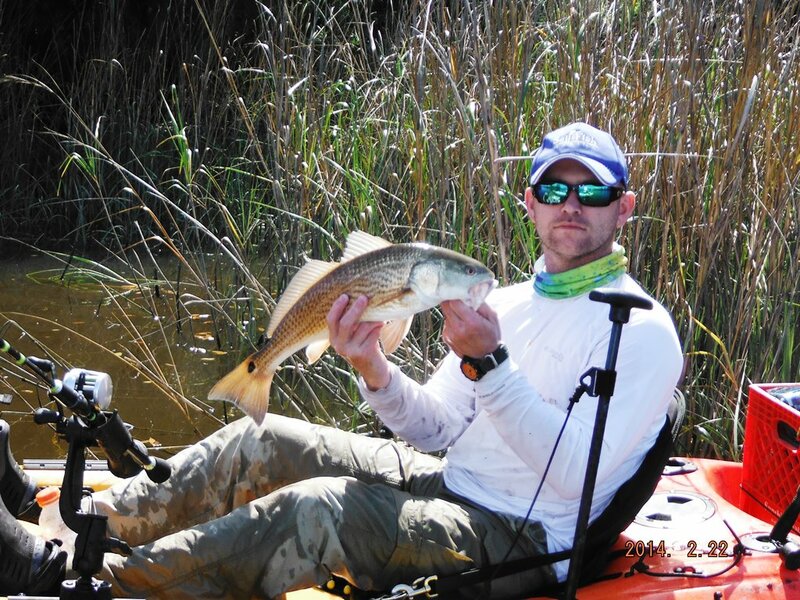 We decided to push back further in the creek in an attempt to stir up some more redfish. 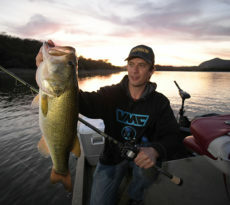 We entered my fishing hole, and it wasn’t long before my Okuma Helios rod doubled over. I reeled in a chunky 22” redfish, and after a quick once over, she was released to fight another day. 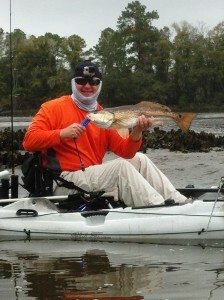 Anthony joined in on the fun and started landing redfish himself. My next cast, I saw the rod tip bounce of my Okuma Helios rod, and quickly grabbed it, and I knew immediately I had a nice fish on. After landing her and laying her across the measuring board, she was a hefty 27.5” long (over slot), and back into the drink she went to swim off and provide someone else some enjoyment on another day. 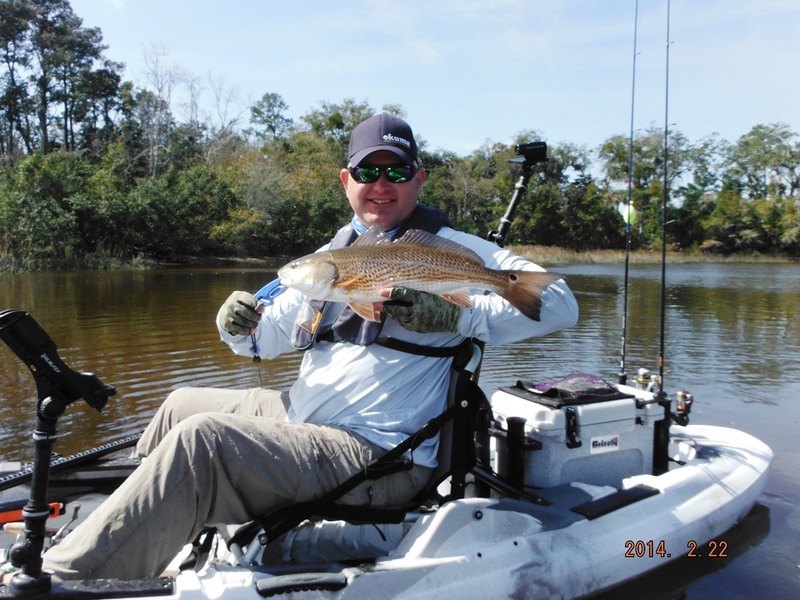 We landed a few more redfish in the 16-17” range, and decided to call it a day before the rains came in. We ended up landing 6 redfish each on the day, not bad for a couple hours on the water. After such an epic couple of days on the water, I’m exhausted, but already looking forward to what next weekend holds. 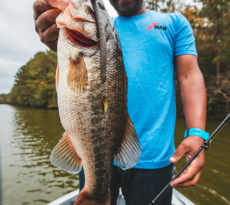 I was honored to share the weekend and the epic bite with so many wonderful people, and glad that we were able to put you guys on the fish. Plans are already in the mix for some more fishing trips, and I can’t wait to get on some more redfish.